Advance Reservations Required. If your group is not able to arrive at the scheduled time, we may need to shorten your tour. After you have made reservations for your tour, you will receive a confirmation letter and a map showing where the Funk Heritage Center is located on the campus of Reinhardt University. It is suggested you provide your bus driver a copy of the map. Note, the Center is located off Hwy. 108 and it is not necessary to enter the campus to go to the Center. These guidelines have been written to include all areas visited by group tours or during special events held at the Funk Heritage Center. If these guidelines reference section of the Funk Center your group will not be visiting, please disregard that section. Teachers and chaperones are responsible for the discipline of the students. One adult chaperone is required for every ten (10) children; that chaperone is admitted free of charge with a minimum of 20 students. Students must be accompanied and supervised by an adult at all times. Students are not to play in the pine straw around the building, climb the sides of the foundation or play on the handrails at the front of the facility. Please don’t touch. Fingerprints damage! Objects and exhibits that may be touched are labeled accordingly. Video/flash/non-flash photography is not permitted in the art galleries. Water bottles, candy, gum or any other food or drink is not allowed inside the Bennett History Museum. 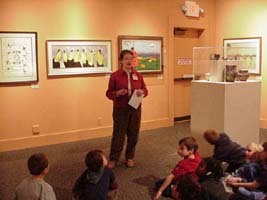 Students, teachers and chaperones are asked not to talk among themselves while the guide is speaking. All cell phones, pagers, PDAs, etc., must be turned off during the tour. When changing rooms or areas, keep voices low so other groups are not disturbed. Guides welcome questions. If time does not allow questions during presentations, please see guide at the end of the tour. Outdoor picnic facilities are available for 150 - 200 people. We do not have indoor facilities for food or drinks during inclement weather. We would like to encourage your group to shop in the Museum Store, if possible. These sales provide a major support for the non-profit Funk Heritage Center. The store offers a wide range of merchandise from inexpensive souvenirs to high quality items. Please note, 6% sales tax will be added for sales tax. One teacher/chaperone is required per 10 students inside the store. If the majority plan to shop, it will be a 15 minute stop on their tour. If only a few children plan to shop, they may do so during lunch. Teachers/chaperones should assist students in quickly selecting items within their budget. If shopping during a tour, each student's purchased items will be put in a bag with student's name and given to the teacher at the end of the tour. Students will be asked to wait outside their store after they have checked out. Teachers and chaperones are invited to come back and shop during lunch. 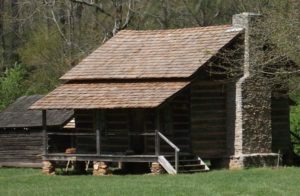 If your tour includes a trip to the Appalachian Settlement, please make sure everyone is properly attired for weather conditions, including shoes for trail walking. Visitors should stay behind their guide. Please let the guide set the pace for the group. No running, watch your step and stay on the trail. Wasps, yellow jackets and other insects are prevalent during certain times of the year. Please be aware: poison oak and poison ivy are common to the area. Do not touch items displayed in the cabins. Do not move tools, rocks, sticks, logs or pick vegetation. We appreciate you scheduling a group tour to the Funk Heritage Center. We hope you will have a wonderful learning experience. Thank you for your cooperation and enjoy your visit!